Akita Elpida Memory has put together a Multi Chip Package (MCP) with 20 stacked dies, that measures just 1.4mm thick, making it the world's thinnest. Akita Elpida is a new company established in July, 2006 by one of the leading global DRAM suppliers, Elpida, to focus on semiconductor back-end processes as part of the Hitachi group. High density packages today can have 5 to 7 die in them, but these 20 die are ground down to 30µm thick, with 40 µm low loop wire bonding and technology for injecting resin into narrow gap. This all needs new specialist equipment for handling the ultra-thin die. This is just for memory at the moment, but with 4Gbit memories you are now talking 10Gbytes in a single package, great for applications where weight and space are at a premium. The real value is using this approach for other chips, which is where the connection with the Hitachi group (including chip supplier Renesas Technology) is important, putting processors and phone baseband and RF and memory in that package makes a compelling proposition. VIA Technologies has finally officially launched the pico-ITX format that has been floating around for the last few months. This is the world's smallest x86 mainboard format that measures 10cm x 7.2cm for a complete PC platform. Fitting into the palm of the hand is going a bit far, but it is a minor marvell of engineering. This compares with mini-ITX at 17cm x 17cm, and Nano-ITX at 12cm x 12cm, half the size of the Mini-ITX. The VIA VT6047 Pico-ITX mainboard was designed to be powered by one of VIA’s energy efficient processor platforms, such as the VIA C7 or fanless VIA Eden processor in the 21mm x 21mm nanoBGA2 package, combined with VIA's system media processors. "The Pico-ITX represents VIA's commitment to spearhead x86 innovation through our proven technology leadership in driving down the platform size," said Richard Brown, Vice President of Corporate Marketing at VIA Technologies. "As with the Mini-ITX and Nano-ITX form factors before it, this new platform has raised the excitement level among enthusiasts and customers alike, firing the imagination an almost unlimited range of what were previously impossibly small systems." The reference design has already been demonstrated at CES, CeBIT and the Embedded System Conference West, and the VIA Platform Solutions Division says it will announce the first commercial mainboard based on the Pico-ITX form factor 'shortly'. I'm stunned that the Bluetooth market is still booming, as Bill McClean of market researcher IC Insights sees this as the 'Bright Spot' in the 2007 chip market with module unit shipments forecast to surge 47% this year. According to IC Insights data, Bluetooth module unit shipments increased from virtually nothing in 2000 to 515 million last year and are forecast to grow to 1.63bn units in 2010. An interesting fact is that cumulative shipments of Bluetooth modules exceeded 1 billion in 2006. Over the 2006-2010 time period, unit shipments are forecast to grow at the strong rate of 33% per year. The Bluetooth chipset market is forecast to expand from $1.47bn to more than $3.2bn over that 2006-2010 time period. Moreover, the ASP (average selling price) of a Bluetooth chipset in 2010 is forecast to be about one-fourth the price in 2002. Low cost is one of the main factors enabling more widespread deployment of Bluetooth technology but creates a problem for the chip makers. There is no doubt that Bluetooth was over-hyped early on, says McClean, but as the price has dropped, the extra cost of adding Bluetooth has become easier to absorb. Bluetooth can now be found in a wide variety of products at all price levels and this is driving the growth. Many of the leading automobile manufacturers have stated that Bluetooth will play a key role in establishing telematics applications. Given that approximately half of all cell phone calls originate from cars, and that countries increasingly are banning the use of cell phones while driving, hands-free calling in the automobile should become quite common. That application is a perfect fit for Bluetooth. Another potentially very large market for Bluetooth devices is in stereo audio applications, especially stereo headphones for portable digital music players. It is rumored that Apple will soon launch a version of its iPod with built-in Bluetooth connectivity. All very good news for Cambridge Silicon Radio, which dominates the market but is looking to expand out into WiFI and VOIP solutions. VIA Technologies appears to have broken into the desktop market with the world's largest PC maker in what could become the world's largest market - China. 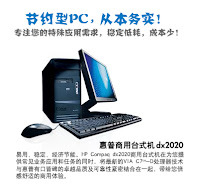 HP is using VIA's 20W, 1.5GHz C7-D desktop processor for its HP Compaq dx2020 commercial desktop PC for the Chinese market. VIA has been shipping low power embedded processors and motherboards with great success but has not really broken in to the commercial market. However, the graphics only allows the dx2020 to support Windows XP, rather than Windows Vista. Apple's TV player has been hacked, allowing the $300 unit to run the OSX operating system and so run any Mac applications. That's what comes of using an Intel processor for an embedded system! The hack, now with its own blog at Apple TV Hacks, highlights things like the ability to put on an RSS newsfeeder, and is also offering a $1000 prize for the first team to get the system to accept a USB disk drive. It's been popular, says news site The Inquirer with over 500,000 hits a day! As an architectural licensee of the Power architecture, AMCC has integrated dual PCI Express, Gigabit Ethernet and security into the 405EX, which is built on a 90nm process with a frequency range up to 667MHz, capable of over 1,000 DMIPS of processing with sub-2W power consumption. The internal cross bar bus architecture, security acceleration and integrated Gigabit Ethernet Media Access Controllers (MACs) ensure that the full bandwidth of 802.11n will be available and reduces the external components required for next generation WLAN access point designs, which reduces systems complexity and bill of material cost resulting in faster time-to-market and lower cost products. "Vendors continue to demand increased performance, lower power consumption and reduced costs from their component suppliers," said Linley Gwennap, principal analyst of The Linley Group. "AMCC's 405EX meets these challenges using a new 90 nm version of the Power Architecture 405 core and increased integration of system functions. Wireless access-point designers in particular will welcome the processor's connectivity, very low power and excellent security options." "The 405EX offers major advancements in performance, bandwidth, security and multi-platform support for next generation access points based on the new 802.11n and WiMAX standards," said Sam Fuller, vice president of marketing at AMCC. "The increased performance, low power, and security acceleration capabilities of the 405EX processor will ensure AMCC's leadership position in this increasingly demanding market." The 405EX features a Turbo Security Engine that supports standard IPSec, SSL and DTLS security protocols. This Security Engine attaches directly to the processor bus for the fastest possible system throughput. The engine also features Public Key Acceleration and True Random Number Generation, as well as full header/trailer protocol processing. It is compliant with FIPS-140-2 and ANSI X9.17 Annex C.
The 405EX will sample in the third quarter of 2007 at $17 in volume. Spansion is adding a microcontroller to its non-volatile memory chip that combines multi-level NOR and NAND technology. The MirrorBit Eclipse architecture combines multi-bit per cell NOR, NAND and flash memory on a single die. This will allow mobile phone handset makers to save up to 30 percent or more on their handset memory subsystems bill of materials costs, while giving them more flexibility in their designs. This comes at a time when arch-rival Intel is looking to focus more on NAND mass storage (like that used in MP3 players) than NOR, where it dominates the market, particularly in mobile phone handsets. The NOR interface of MirrorBit Eclipse gives program and data storage with XIP (execute-in- place), reducing the amount of DRAM in the system, while the ORNAND and 4 bit/cell Quad combination allows large amounts of multimedia content to be stored on the same die. It also integrates a programmable microcontroller, which replaces the conventional state machine typically used in Flash memory and also supports built-in self test (BIST). The company expects first silicon in Q3, and plans to sample 65nm MirrorBit Eclipse solutions built from 300mm wafers at its SP1 facility later this year. Based on 2-bit per cell MirrorBit technology, these solutions will have the ability to run code at the high speed of traditional NOR. At 45nm, the solutions are planned to include both 2-bit per cell and 4-bit per cell storage, significantly increasing the density, and enabling the seamless combination of high- performance code storage with large blocks of multimedia storage capacity. "The MirrorBit Eclipse architecture is the result of a multi-year strategy to leverage a single technology, MirrorBit, to develop a broad range of solutions including NOR, ORNAND and Quad solutions to meet customers' requirements. Now with the MirrorBit Eclipse architecture, we will bring together all three solutions on a single die to deliver a powerful combination not previously possible in the industry," said Bertrand Cambou, president and CEO of Spansion, the memory joint venture between AMD and Fujitsu. "MirrorBit Eclipse architecture's ease-of-use and compatibility with existing platforms can enable handset OEMs to rapidly bring to market innovative feature phones at the same or lower costs to hit industry standard price points." 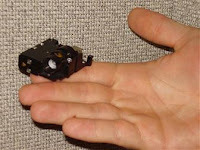 Texas Instruments has demonstrated a prototype of a pico-projector small enough to fit into a mobile phone (left). This uses the Digital Light Projector chip technology that powers back projection TVs, projectors and battery-powered pocket projectors for mobile phones. The DLP pico-projectors (bottom), either as standalone projector or as an integrated component in mobile devices, will provide consumers and business professionals with the flexibility to share video and graphic content in a larger way says TI. The pocket projectors are already in the market from manufacturers such as Mitsubishi, Samsung and Toshiba, and market researchers Pacific Media Associates (PMA) expects this market to grow to more than 1M units by 2010. The former CEO of Elixent in Bristol is taking over at low cost embedded processor company Cyan in Cambridge, having been a consultant to the company. Former CEO Paul Johnson, who rescued the firm with Chris Davis after its 2002 liquidation, becomes president and chief technical officer. Lamb saw the sale of Elixent to Panasonic last year, and set up consultancy Nxcetera that included Cyan as a client as well as Bristol design house Riverbeck. Before Elixent he was senior vice president of sales at configurable processor IP company ARC and managing director of Actel in Europe. Cyan spun out of Cambridge Consultants, using the 16bit XAP core that is also used in Bluetooth chips from Cambridge Silicon Radio, and one of the big selling points is the CyanIDE development environment for the chip. Cyan has struggled in the past but now claims to have 100 design wins, mostly in China. ARM has teamed up with Synplicity to get its Cortex M1 core out to designers of FPGAs. The M1 core (see below) is designed specifically for FPGAs, and this will dramatically help ARM tackle the designers in large OEM companies who might otherwise design ASICs or choose a standard part. Synplicity has been targeting the same designers to persuade them to move over from ASIC design to FPGA, but using the same ASIC design approach that they are comfortable with. Under the marketing and collaboration agreement Synplicity’s R&D team will use the Cortex-M1 processor as part of standard product validation procedures and the corporate engineering also has access to the Cortex-M1 processor IP to provide mutual customer support. This is a significant move to get M1 onto the leading Xilinx and Altera FPGAs and build up ARM's OEM licensing business. ARM worked closely with Synplicity during the development of the Cortex-M1 processor and used Synplicity’s industry-leading Synplify Pro synthesis software extensively during the development process. It also worked with Actel to put the core in Actel FPGAs and in Actel's design flow as the first route to market. The ARM-Synplicity reference methodology for the Cortex-M1 processor includes capabilities for physical and logic synthesis design flows. The Synplify Pro software is the industry's most widely used FPGA synthesis solution, using an ASIC-like timing-driven approach to synthesis.